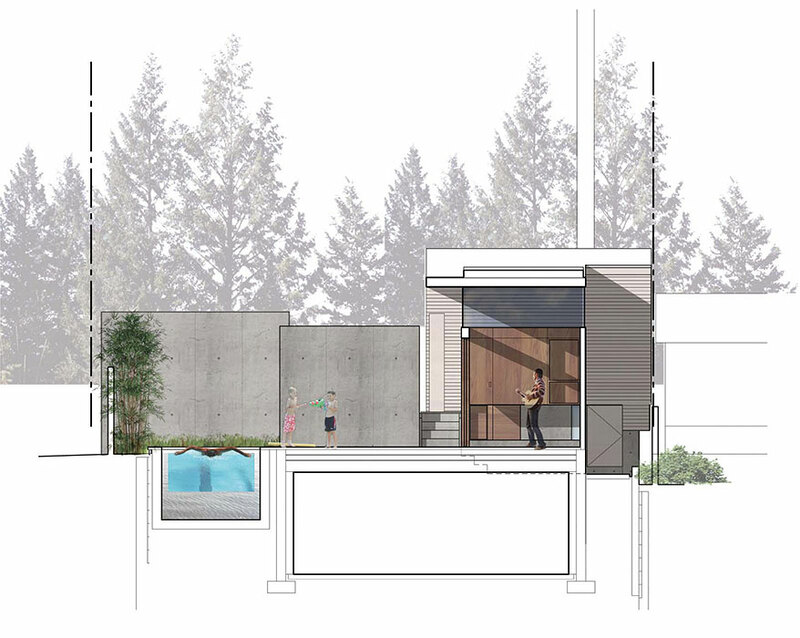 This project creates a private, intimate, and adaptive outdoor living space that includes a lap pool, pool pavilion, and garage on a tight urban site. Alterations to the existing home create strong indoor-outdoor connections with these new elements and spaces. At just nine feet wide, a long, narrow addition stretches from the existing house to the alley. Gently inflected roof and wall surfaces tie the pool pavilion and the garage into a single form that responds to the changing levels and needs of each use. At the pavilion the roof hovers. Lifted above clerestory windows it creates an airy lounging space. The addition is clad in stained horizontal cedar. Matching fences and architectural concrete walls create a highly defined and integrated sequence of both indoor and outdoor space. The material composition and sanctuary-like feeling of this retreat is reinforced by sophisticated and strategic landscape plantings. Full-height storage cabinets and doors, constructed of rift cut white oak, interconnect the kitchen, living area, and pavilion to create an overall feeling of continuity & openness throughout the spaces.